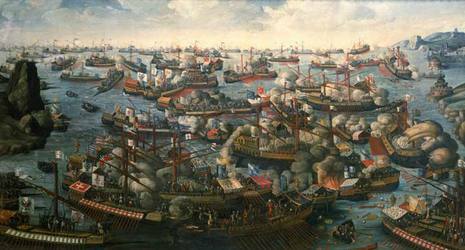 The Battle of Lepanto (Greek: Ναύπακτος, Naupaktos, pron. Náfpaktos; colloquial Greek: Έπαχτος, Épahtos; Turkish: İnebahtı) took place on 7 October 1571 when a galley fleet of the Holy League, a coalition of Spain (including their territories of Naples, Sicily and Sardinia), the Republic of Venice, the Papacy (under St. Pope Pius V), the Republic of Genoa, the Duchy of Savoy, the Knights Hospitaller and others, decisively defeated the main fleet of Ottoman war galleys. The five-hour battle was fought at the northern edge of the Gulf of Patras, off western Greece, where the Ottoman forces sailing westwards from their naval station in Lepanto met the Holy League forces, which had come from Messina. Victory gave the Holy League temporary control over the Mediterranean, protected Rome from invasion, and prevented the Ottomans from advancing further into Europe. This last major naval battle fought largely between rowing vessels has been assigned great symbolic importance since then.